Like millions of people around the world, I start my day off with at least one cup of coffee. For years, I used a typical ground coffee brewer, but was never truly happy with it. After seeing a friend’s Tassimo, and hearing his and his wife’s glowing review of it, I decided to get one myself and give it a try. That was a few years ago, and I think I’m finally ready to give it a proper review. Tassimo is a hot beverage machine that uses prepackaged “discs” to make a variety of coffees, teas, and other hot beverages. In a nutshell, you fill its tank with water, place a Tassimo “T DISC” in the machine, close a lid, hit a button, and in a minute or so your beverage is ready. Each T DISC makes one cup of whatever beverage you’re making, and when it’s done, you just open the lid and throw the T DISC away. That’s all the clean-up you have to do with it (for the most part — more on that later). Tassimo is owned by Kraft. 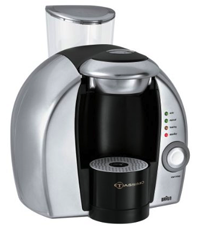 There are at least two Tassimo machines on the market, one by Bosch and one by Braun. Mine is Braun. There are many different types of coffee, espresso, cappuccino, latte, hot chocolate, and tea T DISCs available. One of the unique features of the Tassimo is how it utilizes a bar code on each T DISC that tells the machine how hot to make the water, and how long and in what way the brewing process works. You can hear the difference it makes while brewing a T DISC of coffee, versus one of hot chocolate or tea. Additionally, it has T DISCs of milk for those drinks that use it like cappuccinos or lattes. Once the coffee portion is done, you take out the coffee T DISC, insert the milk T DISC, and press the Start/Stop button again, and shortly you have frothy milk or however your drink utilizes it. You can even mix and match T DISCs however you like. For example, try using an espresso T DISC, then a hot chocolate T DISC. Mmmmm. Since I mostly make coffee with my Tassimo, and since it was bought to solve my frustrations with ground coffee brewers, coffee will be the focus of this review, but I have used it to make a wide variety of the other hot beverages available. There are three main advantages to Tassimo for me: convenience, consistency, and flexibility. Convenience — It’s extremely convenient for me to be able to make one cup of coffee at a time. In a typical brewer, you measure the amount of water for the number of cups you want to make, then measure the amount of coffee grounds for that amount of water, brew it (which takes about 15 minutes for a typical two or three cup cycle), drink it, spill out the excess, and finally, clean it all out for the next use. You can do the measuring work the night before, and if you splurge and get a programmable brewer, you can have your coffee ready for you when you wake, but you still have to do all the work for each pot, especially the cleaning. With Tassimo, from the time I want a cup of coffee or other hot beverage, to the time I have it in the cup and drinking it, it’s usually under three minutes. And I’ve never not made a drink in the Tassimo because I didn’t want to deal with the hassle of it…there is no hassle. Consistency — Because each T DISC makes one cup of coffee, each T DISC, of each variety, tastes exactly the same as others of that variety. With a typical brewer, if you mismeasure, your coffee will taste completely different than other brews—in fact, it’s somewhat hard to get similar tasting coffee, consistently, with a typical brewer, especially if you often vary the amount you make. Flexibility — When I get up in the morning, I have no idea if I’m going to drink one cup of coffee, two cups, or even three cups before I head off to work. When using a brewer, to be on the safe side, I have to make enough for three cups of coffee, even if I throw two of them away. With Tassimo, I make each cup as I’m about to drink it. No waste. Additionally, the cup is fresh brewed and hasn’t been sitting on a hot plate for an hour or more. The ability for the Tassimo to make other beverages is quite a nice bonus as well. If it didn’t have the ability to make cappuccinos or lattes, I probably wouldn’t drink them, but since it does, I have found that I really enjoy them. The Suchard’s hot chocolate is very good. I’m not a fan of water-based hot chocolates, but there’s so much syrup in the T DISCs that it ends up so rich and creamy that I forget it’s water based. The Chai Tea is amazing! All of the above comes at a cost. First off, the Tassimo itself, at $160, costs more than double the amount of a higher-end programmable ground coffee maker. Additionally, 16 T DISCs of coffee cost $9, which puts the Tassimo per cup cost at $0.56, which is quite expensive, comparatively speaking. However, the cost per cup is relatively similar to the cost per cup of ground coffee if I count just the cups I actually consumed, and not the total cups that could be made, since a lot were discarded due to the fact that I was making three cups per day and only consuming one or two. Additionally, the Tassimo makes more than just straight coffee, so it’s high cost can be justified by convincing yourself that it takes the place of a cappuccino maker and a tea pot as well. Lack of Control — This is fairly obvious, and really shouldn’t be considered a downside since it’s sort of the point of all pod-based coffee makers, but it does need to be mentioned. If you’re a coffee snob, you’re probably not going to be happy with the Tassimo, not because it doesn’t make a great cup of coffee, but because you’re going to want to grind your own beans right before brewing, and then have complete control of the brewing process, something the Tassimo just doesn’t allow you to do. It’d be like someone who really likes driving manual transmission cars renting an automatic. Both cars get you from point-A to point-B, but to a manual enthusiast, the act of driving is part of the fun, just as brewing a fresh pot of coffee is to a coffee snob. However, non-coffee snobs do have some control of the intensity of the brewed beverage. At the end of the brewing cycle, you can make it milder by holding the Start/Stop button and manually adding more water to the cup, and conversely, you can make it stronger by stopping the brewing before it’s normally done. This takes some trial and error, but does work. It’s loud — There’s no other way to say it. It’s not going to wake the neighbors, but others in your apartment/house are going to hear coffee being made. To be honest with you, I’m not sure what wakes me up more, the caffeine in the coffee, or the noise it makes when brewing a cup. To fully illustrate, the below flash audio clip is the sound of a typical Gevalia coffee being brewed. The Tassimo injects water into the T DISC for the first five seconds, waits ten seconds, then forces the water through the T DISC and into the cup for the next 50 seconds. Using a hand held sound level meter at the distance I normally stand whilst making coffee, the decibel level of the first five seconds are about 88 dB, which is around the level of a noisy street or a subway train. The rest of the brewing is about 73 dB, which is the same as a household vacuum. For more perspective, my alarm clock tops out at 68 dB, which is about the same as Guns N’ Roses’ "Welcome to the Jungle" being played at a good volume in my living room. Tassimo may not seem that loud, but having that noise as one of your first real sounds of the day, you can see how good a job it does at waking you up. The initial shock of its volume in no way detracts from the quality or the enjoyment of the beverages, it produces. However, if you like to get up early and have a cup of coffee while your spouse sleeps, the Tassimo might not be for you. Can’t just use any coffee — You have to use Tassimo T DISCs and are limited to the varieties available on them. There seem to be enough coffee varieties to suit just about everyone…Starbucks, Gevalia, Seattle’s Best, and Maxwell House, just to name a few, and each brand has several different varieties to suit different tastes (I like Gevalia's Signature Blend best). The T DISCs are sold in housewares and department stores wherever you can buy the Tassimo machines, but I haven’t seen them in supermarkets. This means that you’ll have to visit an additional store to get your coffee fix, or you could get them delivered through mail order. In addition, I suggest identifying a “backup” store that has them in case your primary source is out/closed/etc., otherwise, it’s possible you could run out of T DISCs, if you’re not careful. The first time you make anything in the Tassimo after it’s been sitting for a while, you have to wait for the water to warm up. It starts warming the water as soon as you open the lid to insert a T DISC, but you have to insert a T DISC and close the lid for it to fully warm up (it needs to know what it’s making to know what temperature to bring the water to). For a typical cup of coffee, this warm up time is around one minute five seconds (1:05). Once the water is warmed up and the green “ready” light is lit, you can press the Start/Stop button to start the brew, and it takes another one minute five seconds (1:05) to actually brew the cup of coffee. That’s a total of two minutes ten seconds (2:10) to brew the first cup of coffee in the morning. Because of this, I’ve adjusted slightly the way I handle my morning routine. When I get out of bed, I walk into the kitchen and put a coffee T DISC in Tassimo, and make sure there is more than enough water in the tank. While it’s warming up the water, I head off to the bathroom and take care of #1. I then go back to the kitchen and find, by that time, that the water is warmed up and Tassimo is ready to brew a cup of coffee, so I hit the Start/Stop button and the brewing, amazingly, starts. While it’s brewing, I go into the living room and start turning on lights, radios, TVs, etc. I then go back into the kitchen where my coffee is waiting for me, add milk, then sit down in the living room and enjoy it. Most of the time, clean up is as easy as throwing out the used T DISC. Once a month or so, it’s a good idea to clean the rest of the unit. All that’s involved is removing the tank that holds the water and cleaning it, and removing two parts from the lid area where the beverages come out and cleaning them. All told, it takes about five minutes and is very easy to do. However, when making hot chocolate, I’ve noticed that the syrup seems to stick a bit to the nozzle as it comes out. This needs to be cleaned shortly after you finish enjoying the hot chocolate, otherwise it can dry and cause the nozzle assembly to get stuck to the rest of the machine. This doesn’t cause any problems when making beverages, but it does make it hard to clean when you need to. I really like my Tassimo and the hot beverages it makes. It’s simple to use, makes clean up a snap, and has a wide variety of beverages to keep me exploring. It’s not inexpensive, but I think it pays for itself with its ability to make many different types of beverages, as well as the time and energy saved in the setup and clean up aspect of being a coffee addict. I would highly recommend Tassimo to anyone thinking of getting a single-serve “pod” type coffee machine. In my book, the biggest compliment someone can give a product is to say that they would buy a replacement if the first one stopped functioning after a reasonable period of time. If mine broke next week, I’d almost definitely get another one. One more thing…when you make anything in the Tassimo, make sure you have a cup under the spout before you hit the Start/Stop button. Trust me.